Begun Bhaja: Begun bhaja are pan fried or shallow fried eggplants (aubergine). 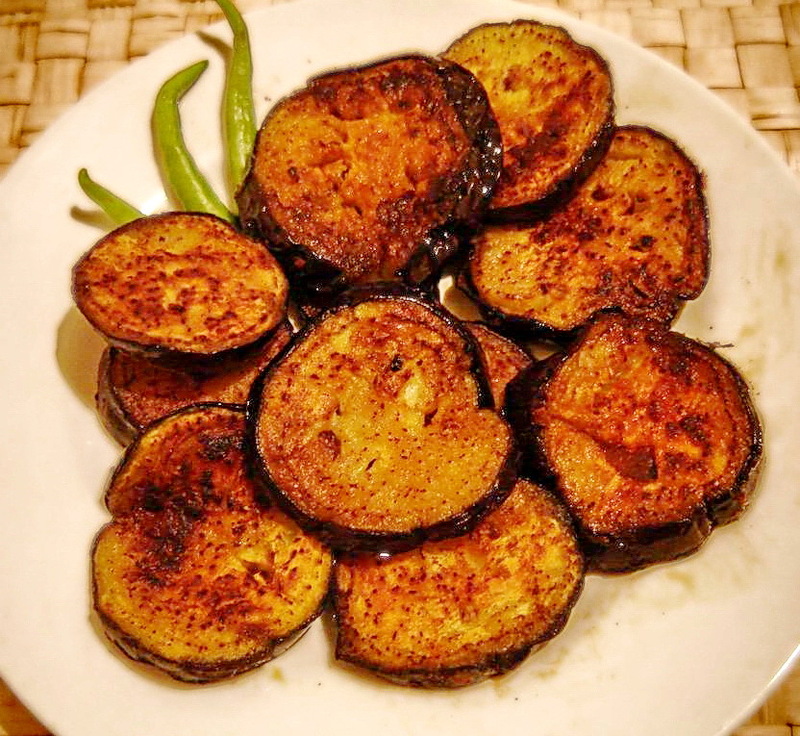 Begun is the bengali word for eggplant and bhaja means fried. Bengalis serve this as an accompaniment for rice, rotis or just as a snack. Begun bhaja is made in a very simple way by slicing and marinating bigger sized eggplants with turmeric powder, salt and a pinch of sugar & shallow fried in oil. Mix chilli powder, turmeric powder, garam masala powder, dried mango powder and salt in a bowl. Rinse the eggplant well in water. Pat dry the eggplant with a kitchen towel. Slice the eggplant in 1/2 inch thick roundels. Soak the sliced eggplant in salted water for 15-20 minutes. Remove and pat dry all the eggplant slices. Marinate the eggplant slices for 5-7 minutes. Heat the oil in a pan, for shallow frying. Take the rice flour in a plate. Coat each eggplant slice with rice flour. Dust off the extra rice flour. Now pan fry the eggplant slices till crisp and golden brown on both sides. Drain excess oil from fried eggplant slices on paper tissues. Begun bhaja is ready to be served. Serve hot begun bhaja with yogurt dip and some bread or rotis or naans. If you have any queries regarding the Begun Bhaja recipe, please leave a comment.